Beard’s landmark limited edition monograph published by Taschen in 2007. There were two versions originally published. The Collector’s Edition is limited to 250 individually numbered copies. Each copy is individually signed by Peter Beard. 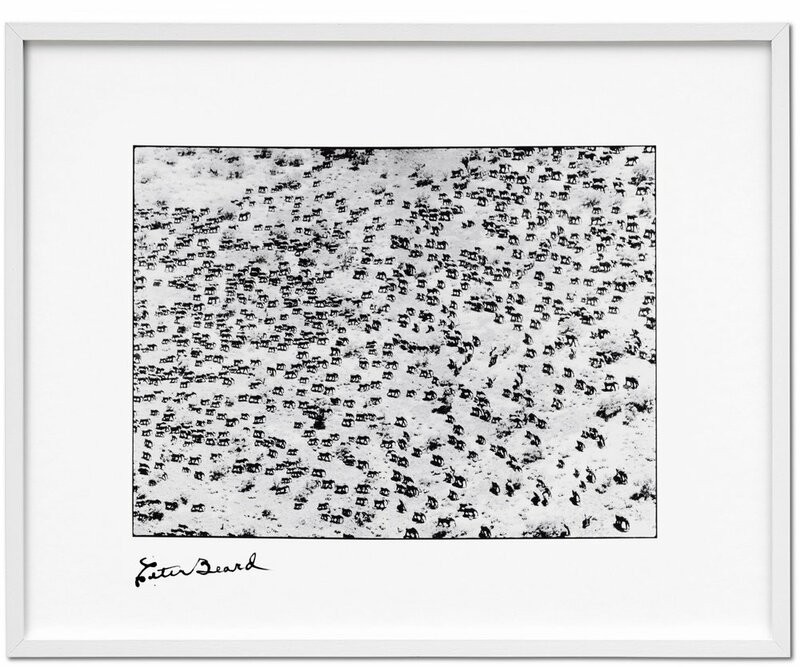 This edition is accompanied by a gelatin-silver print photograph: "965 Elephants" (1978/2006). The print measures 16 in. x 20 in. and is signed by the artist. The book cover is crafted in sumptuous leather and the volume is packaged in a velvet-lined wood shipping crate. This book has never been opened and is still in its original packing box. Bio: Born in 1938 in New York City, raised in New York City, Alabama, and Bayberry Point, Islip, Long Island, Peter Beard kept diaries at an early age. He took his first pictures at twelve and photography quickly evolved into an extension of his diaries. In 1957 he entered Yale University as a pre-medical student but soon switched to art history, studying under Vincent Scully, Joseph Albers, and Richard Lindner. Trips to Africa in 1955 and 1960 piqued his interest and after graduating from Yale, he returned to Kenya via Karen Blixen (Isak Dinesen). In the early 60s he worked at Kenya’s Tsavo National Park, during which time he photographed and documented the demise of over 35,000 elephants and 5000 Black Rhinos and published two The End of the Game books (1965 & 1977). During this same time period, he acquired Hog Ranch, the property adjacent to Karen Blixen’s near the Ngong Hills and made it his home base in East Africa. Beard has written further works on his African experience: Eyelids of the Morning: The Mingled Destines of Crocodiles and Men (1973), Longing for Darkness (1975), and recent books Zara’s Tales: Perilous Escapades in Equatorial Africa (2004) written for his daughter and his latest book Peter Beard, published by Taschen in November 2006. His first exhibit was at the Blum Helman Gallery In New York in 1975 and was followed in 1977 by the landmark installation of his photographs, elephant carcasses, burned diaries, taxidermy, African artifacts, books and personal memorabilia at the International Center of Photography (his first one man show) in New York City.